C.J. Redwine deftly blends light fantasy elements and a post-apocalyptic, dystopian world to create an impressive debut novel. Unfortunately, there isn’t much in the way of world-building – we have no idea what time period this could have taken place in and we aren’t given very much in terms of history. Defiance alternates between Rachel and Logan’s perspectives however aside from a few key differences – Rachel’s stubborn, often irrational behaviour and Logan’s methodical, logical approach to everything – these characters are given the same “voice.” Despite this, the characters themselves are quite likable, and nicely balance each other out. 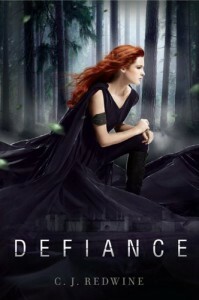 Overall, a strong female lead, plenty of action, romance that doesn’t take over the plot, believable character development, and beautifully written prose make Defiance a book that is definitely worth reading.